Almost 50 years after its premiere, Tim Rice and Andrew Lloyd Webber's Joseph and the Amazing Technicolor Dreamcoat is still as popular as ever, attracting audiences of all ages and playing to full houses up and down the country. The titular dreamcoat is currently being sported by X Factor winner Joe McElderry, who returns to the role this year after a stint in 2016. He stars opposite Lucy Kay, a Britain's Got Talent alumni best known for her classical singing, who takes on the role of the narrator. Joe McElderry's clean cut look and radiant grin make him a perfect teen idol Joseph aesthetically, but it's his excellent voice which make McElderry's turn as the eponymous dreamer so commendable. His show stopping rendition of iconic ballad Close Every Door on its own is almost worth the price of admission. It's just a shame that at times the production's zealous band overpower vocals, making the sung through musical slightly harder to follow. There are some really brilliant numbers in Joseph and the Amazing Technicolor Dreamcoat. Of course everyone is familiar with Any Dream Will Do, but Jacob and Son, and One Less Angel in Heaven are also earworms worth mentioning. Lloyd Webber has certainly always known how to write a catchy tune. The show is full of toe tapping numbers, in musical styles ranging from country to calypso! There's even an Elvis Presley inspired rock and roll number for Pharaoh in act two, as well as a rather fun Charleston inspired number. The various music styles, and accompanying props and costumes, make the whole show extremely bizarre, but also help to create a fun party atmosphere. Although at some points this production does seem a bit cheap and cheerful, amid the dizzying myriad of lights, corny '90s boy band choreography, and blindingly bright costumes, the slightly outmoded elements are scarcely noticeable. 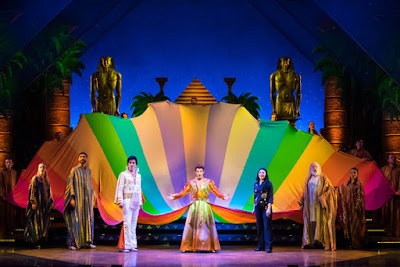 Of course, this production of Joseph and the Amazing Technicolor Dreamcoat isn't perfect, not least because the musical itself is hardly a musical theatre masterpiece. In fact, it's a total cheese fest with lots of posturing, jumping up and down and inviting the audience to clap. However, at the end of the day it's good clean family fun that will no doubt provide many youngsters with their first taste of musical theatre, and which continues to be a beloved show to both theatre fanatics and casual audiences. It's hard to criticise a show as joyful as this one, and so regardless of its outlandish unconventionality, and economical production design, Joseph and the Amazing Technicolor Dreamcoat is worth seeing at least once!